For each guitar lover we have a nice keychain. All regular guitar types are available. From the Stratocaster-type to the Les Paul-type and from Gretsch-style to the Telecaster-style. And from a Gibson-type to the Vee-style and off course the bass guitar and the acoustic guitar. The metal keychains are 70 mm big and have characteristic details. 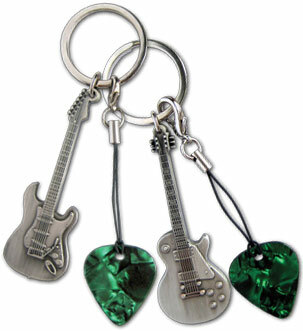 There is also a metal cord with a green pick on the 30 mm metal keyring. The perfect gift for every guitarist! Our introduction price for these keychains is now temporarily € 9,95 a piece. We ship to most European countries with standard shipping and handling costs of € 4,95. Metal keychain. Type guitar: Les Paul-style. Size: 7 cm. Characteristic details. With a green pick on a cord. Introduction price from € 13,95 for € 9,95. Metal keychain. Type guitar: Stratocaster-style. Size: 7 cm. Characteristic details. With a green pick on a cord. Introduction price from € 13,95 for € 9,95. Metal keychain. Type guitar: Bass guitar-style. Size: 7 cm. Characteristic details. With a green pick on a cord. Introduction price from € 13,95 for € 9,95. Metal keychain. Type guitar: Gretsch-style. Size: 7 cm. Characteristic details. With a green pick on a cord. Introduction price from € 13,95 for € 9,95. Metal keychain. Type guitar: Telecaster-style. Size: 7 cm. Characteristic details. With a green pick on a cord. Introduction price from € 13,95 for € 9,95. Metal keychain. Type guitar: Vee-style. Size: 7 cm. Characteristic details. With a green pick on a cord. Introduction price from € 13,95 for € 9,95. Metal keychain. Type guitar: acoustic guitar-style. Size: 7 cm. Characteristic details. With a green pick on a cord. Introduction price from € 13,95 for € 9,95. Metal keychain. Type guitar: Gibson-style. Size: 7 cm. Characteristic details. With a green pick on a cord. Introduction price from € 13,95 for € 9,95.